I doubted it, I tried it, and now I'm here to tell you every thing you need to know about it. 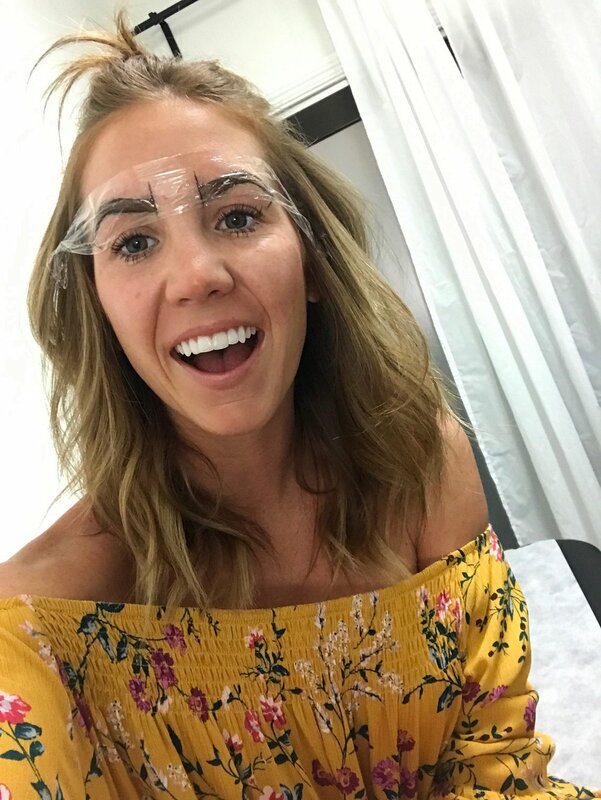 If the world of microblading is new to you... don't fret, I was in your boat just a few months back. A girlfriend showed me instagram before/after pictures of girls who had it done and I was immediately hooked, I wanted my brows to look that perfect. Insert Lauren Shapiro of Starry Eyes Microblading - the cutest cousin in the world. Microblading is tiny tattoo like strokes of pigment under the surface of your skin, to mimic hair strokes! (Way more natural looking than actual tattoo eyebrows- or as permanent) These lines help to create the perfect brows- fill in empty/sparse places, give you a nice arch and align otherwise uneven brows to match the shape of your face! This process can last up to three years depending on your skin type and how well you take care of them. To be honest, I never had bad eyebrows. I'm Italian and mine grow like weeds (not kidding, I have to get them waxed every 2 weeks) BUT I still filled them in everyday, even when I wasn't wearing makeup because they are so sparse towards the bridge of my nose and didn't give me the nice shape and fullness that I loved- without it. Problem no more! To insure perfect symmetry! Then, numbing cream was applied to help with "pain"
A numbing cream is applied before the procedure (okay its not surgery but what the hell else do you call it!?) which eliminates some of the "pain". I wouldn't call this process anything unbearable by any means, but you definitely feel it. It feels as if someone is just scratching your eyebrows with something sharp. Trust me, numbing cream doesn't even work on me and I was still able to sit through this 2 hour process- TWICE. Why twice? I'm sure many of you are asking this! The first appointment is where you get the majority of the work done, but about 6 weeks later you return for what they call the retouch appointment. Strokes that didn't heal right are redone, hairs are added where need be- you know, they're perfected even more than before. This is the process I had done yesterday. She said mine healed perfectly so we just went over a few hairs to make them bolder, elongated the "tail" a bit per my request and added a bit of fullness in a couple places. I'm even more in love now. Probably one of my prettier moments in life! Y'all need to be strict with the after care process, you cant get your eyebrows wet at all for about 10 days! No water, no makeup and minimal sweating! I was really strict with mine the first go around, and they healed perfectly! As soon as they start to get dry (around day 5), I applied Aquafor OR the ointment they provide you with. The idea is to keep your brows moist, as to stop them from peeling and to keep the pigment under your skin! I stayed out of the sun, didn't even get my brows wet when I showered (real real real hard let me tell you!) & I plan to do the same on this round. Go to someone you trust- Lauren is a perfectionist, her kids are the cutest thing ever and her house is perfectly decorated- all by her. I don't trust people who aren't like her to do almost permanent things to me- ESPECIALLY my face! Just went back for another microblading session because OBSESSED! She learned a new technique that uses a tattoo gun to fit in the brows more! It creates a more filled in look (shaded) & I think the bigger and bolder the brows, THE BETTER. I was instantly on board! While we were at it we added some "fluff" to my current brows too with longer microblading strokes! I like them to look a little messy and not too perfect. YALLLLLL- they're so good! SO SO GOOD. A little darker, a little bolder & a lot more perfect. Heads up though- this process was slightly more painful! Nothing unbearable though. (My pain tolerance is pretty high 😬) Beauty is pain though, AM I RIGHT!